We’re in Eceabat on the Gelibolu (Gallipoli) Peninsula where the WWI tourist industry is BIG. We will do our bit by joining a half-day tour of some of the battlefields tomorrow and have visited a Turkish display in the town this evening. It’s strange that those battles seem to have been nation-forming for both Australia and Turkey and disappointing to see the jingoistic nationalism developing on both sides. The Turks refer to the fighting as the Çanakkale Savaşları (Çanakkale Wars). It’s sobering to read their account of those events. The Turkish view is that they gallantly defended their homeland from an invading army – a position impossible to argue against. I hope (but doubt) that many Australian visitors remember that the ANZACs were participating in an act of aggression against Turkey for a strategic objective that had little to do with either Turkey or Australia. I wonder what would have happened had the Allies (Western Powers to the Turks) been successful and gone on to take Istanbul. How did they propose to occupy Turkey for the duration of the war? Did they think the Turks would politely comply? Perhaps it was lucky we weren’t successful. It’s surprising how welcoming and accepting Turks are towards Australians (including Ataturk’s extraordinary statement that ANZACs having lost their lives Turkey had become Turkish sons as well). I doubt that Australians would be so charitable. It’s certainly nauseating to hear Australian politicians complaining about developments here as if we had some rights in the matter. 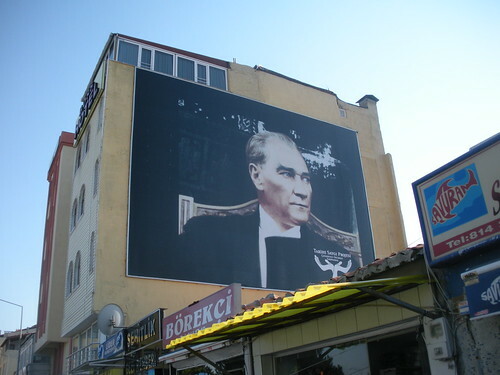 The successful defensive campaign seems to have been the making of Ataturk as the nation’s favourite son. His likeness in pictures and statues can be seen everywhere. This entry was posted on 7 September 2010 at 7:01 pm and is filed under Turkey. You can follow any responses to this entry through the RSS 2.0 feed. You can leave a response, or trackback from your own site.